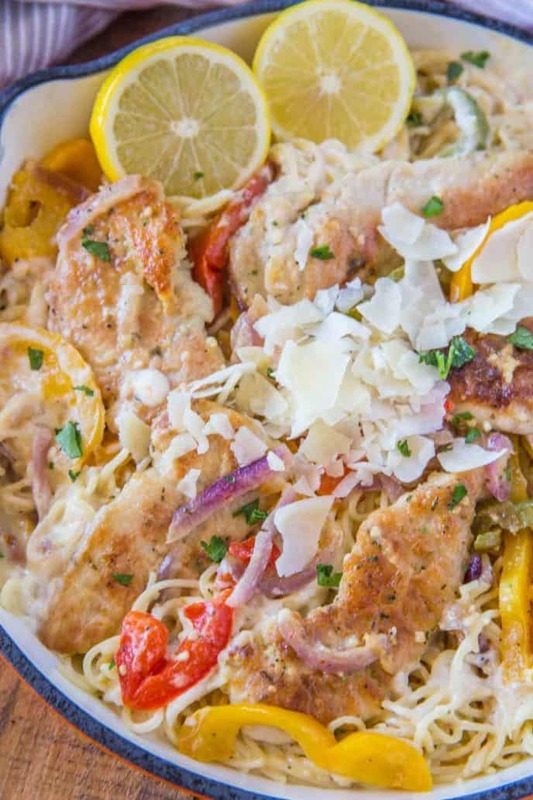 Olive Garden Chicken Scampi Pasta copycat made with a creamy garlic white wine sauce with lemon, bell peppers and onions. 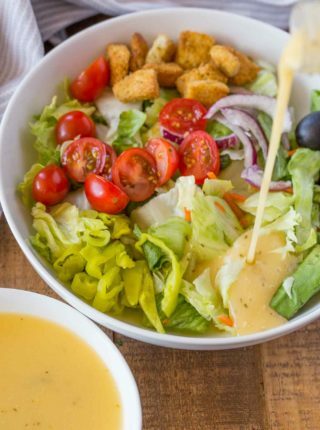 We love Olive Garden pasta dishes including Olive Garden Five Cheese Ziti al Forno (Copycat) and chicken dishes like Olive Garden Chicken Piccata (Copycat) served with their classic salad topped with Olive Garden Italian Salad Dressing (Copycat). Creamy chicken pastas are sure fire winners in our house. This creamy garlicky, lemony, white wine sauce with Parmesan cheese is basically heaven on earth. This sauce would taste delicious with shrimp or pork or even beef medallions as well. What is in chicken scampi? Chicken scampi, similar to the shrimp scampi is a dish classically made with garlic, butter and white wine. 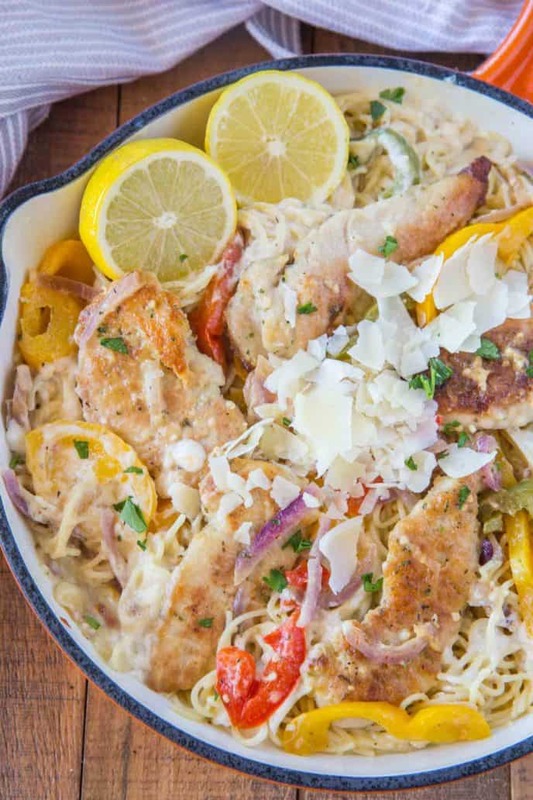 This chicken scampi has heavy cream and parmesan cheese added to the sauce to create a rich, creamy main dish. For an authentic copycat I stuck with angel hair pasta, but I tend to find angel hair pasta is simply too thin, cooks too quickly and won’t hold up to other vegetables and chicken well, breaking too easily. For creamy pasta recipes I tend to stick to spaghetti or thin spaghetti which is still relatively thin while staying strong enough to not break apart in tossing the creamy sauce with the noodles. The base of the creamy sauce is just a roux. The mixture of butter and flour is used to thicken sauces. To start the roux use even parts butter and flour melted and whisked together. Cook the flour just long enough for it to start to turn a creamy beige color (20-30 seconds) to ensure no raw flour taste. Add room temperature or warm liquids, SLOWLY. Whisk quickly while adding the liquids and maintain a creamy texture. Too much at once can break the sauce. Reduce on a medium low or medium heat. Finish with cream, don’t boil the cream down. Also remember, when you’re cooking with lemon and Parmesan cheese they are best added at the end of the cooking time. They are fresh and bright flavors. You can also finish the recipe with more lemon juice or lemon wedges in addition to the remaining parmesan cheese. Like this recipe? Then Like us on Facebook! 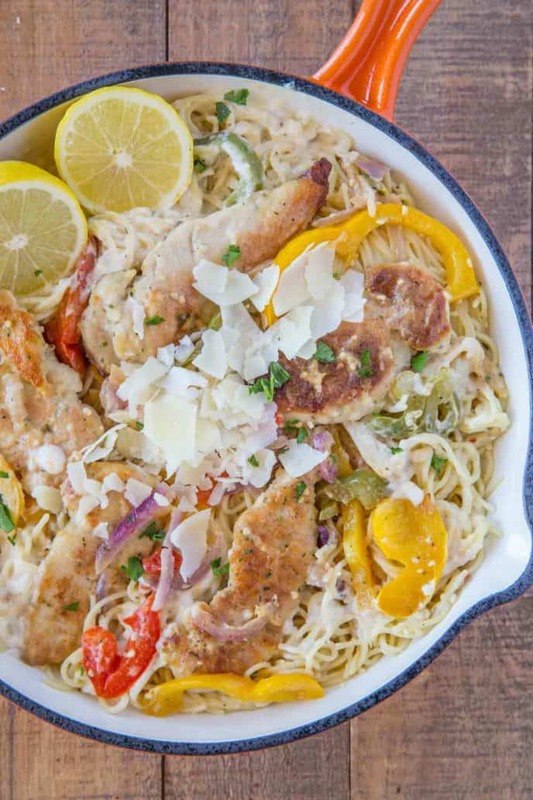 Can you meal prep this chicken scampi? The problem with meal prepping pastas with creamy sauces is that the pasta will continue to soak up the sauce once it is cooled. Sometimes if I am really craving a dish I will keep the sauce separate. Then just before serving add a splash of milk or water and stir with a fork before warming up the sauce just to make it a little thinner. To make the dish easier to eat during lunch I will usually chop the chicken before putting it in containers. This makes it easier to eat with just a fork at work/school. Looking for more Copycat Italian Recipes? Add 2 tablespoons of butter to a cast iron skillet on medium high heat and cook the bell peppers and onions for 2-3 minutes or until slightly softened. Remove the vegetables and add in remaining 2 tablespoons of butter. Once melted add in two tablespoons of flour and garlic. Whisk well until the flour has had a chance to "cook" for about 20 seconds. Add in the red pepper flakes, oregano, basil, wine and chicken broth, then let reduce on medium heat for 18-20 minutes. While the sauce is reducing cook the pasta one minute shy of the instructions, do not rinse. In a second pan add 2 tablespoons of olive oil on medium high heat. Coat the chicken tenderloins in the salt and pepper before tossing in the remaining flour. Add in the chicken, cooking for 3-4 minutes on each side. Remove the chicken from the heat while the sauce finishes reducing. When the sauce is reduced by half add in the heavy cream and whisk well until you have a nice thick sauce. Add in the lemon juice and half the parmesan cheese and whisk. Toss with the pasta, bell peppers and onions. 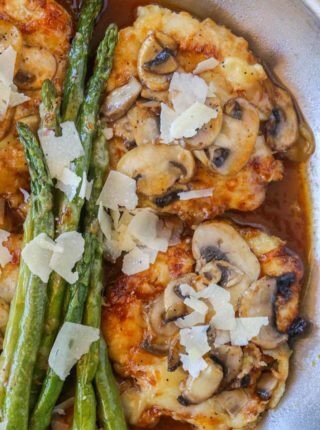 Top with the chicken and Parmesan and serve. 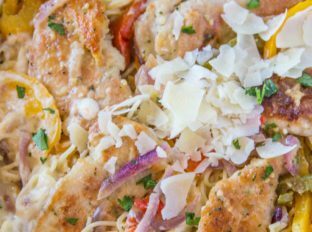 This is the best Olive Garden copycat recipe that I have found for Chicken Scampi! My husband is a lover of that dish and I’m so happy to have found such a wonderful tasting version of the original! I will make this one again and again! My only changes will be to use 8 oz. of pasta instead of 16 oz. and to cut the red pepper flakes down to 1/4 t to reduce the heat a bit. Thank you Chef Sabrina! You’re welcome. I’m so glad you guys enjoyed the recipe. This was beyond delicious. My husband loved it and so did our dinner guest. I added some mushrooms and asparagus that I needed to use up, too. Thank you so much for sharing! Thanks for dropping by to let me know! I’m so glad you all enjoyed it! I just had chicken scampi at The OG a few nights ago. This recipe just saved me 18 bucks (per entree) on future scampi craving nights. I used pinot grigio and a very small amount of parm, and it was DELISH. Hubs, who had eaten half my entree at OG, couldn’t stop raving. A definite keeper/make again; so spot on it was hard to tell a difference. THANK you! Yay!! I’m so glad you both loved it. Well I tried to make this tonight and it was a disaster!!! Maybe I didn’t let the wine reduce enough?? It tasted nothing like Olive Garden!!! I was so disappointed ?? I’m so sorry that happened. If you’d like, you can email me at contact @ dinnerthendessert .com and we can troubleshoot as to what might have happened. There is no cheese in the chicken scampi at Olive Garden. This is the only thing I order when we are there and I am allergic to cheese…so I know for a fact tgat thee is no cheese unless you have the server add it when the food is brought to the table. Feel free to leave it out then. Thanks for the feedback. I can actually try something different when I go to Olive Garden from now on…this is amazing!!! I made this tonight because it is my husband’s favorite dish from olive garden. It is amazing yall!! 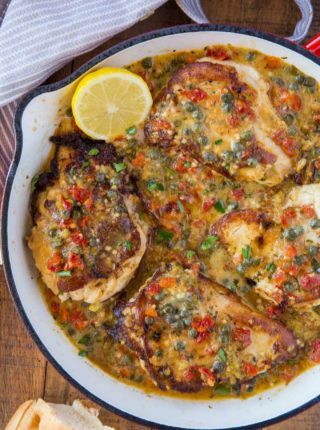 Personally I like it better than the restaurant thank you so much for this recipe! This is my favorite dish at the Olive Garden. I’ve tried many copycat recipes for this in the past but none really measured up. This is the holy grail recipe. Dare I say, it’s even better than the real deal. My family devoured this like it was their last meal. You outdid yourself with this recipe, madam. Kudos to you, and thank you so much! Thank you so much, Emily!! So glad you all enjoyed it! I was very skeptical while making this dish. It is my favorite dish at Olive Garden. I’ll be damned if this isn’t spot on!! Love it! What a great compliment! 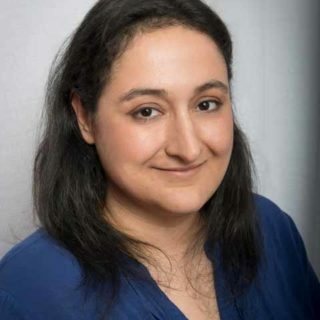 Thank you so much, Gina! Getting ready to make this, what white wine do you recommend to cook it in? Any white wine will do but if you don’t have any on hand, I would suggest getting either a Pinot Grigio, Sauvignon Blanc or Unoaked Chardonnay. Enjoy! I followed the recipe and it came out delicious! I may never go back to Olive Garden. Haha Kisha, but when you’re there, you’re family! How can you be so presumptuous to assume you can be family at home?! ??? I love copycat recipes and this one looks FANTASTIC! 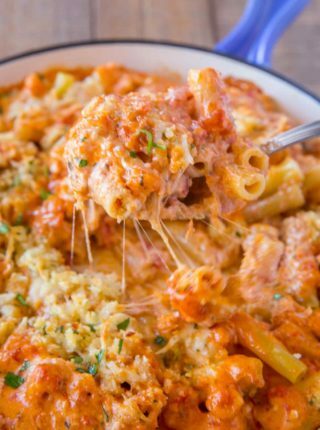 What a great looking pasta dish! I would devour this quickly! Oh wow! I can’t wait to try this!! It looks faaaantastic!! OMG! How creamy is this pasta! This is exactly what I need right now! This looks even better than the original! I love copycat recipes. Chicken scampi is so good!